WAFFLES: Testing, 1-2-Chicken. Can you hear me? Helloooo? Today's photos are some of our 2014 favorites. This was Waffles' first encounter with the bathroom sink. We especially love these because they highlight his goofy personality and sweet naiveté. Of all the cats Glogirly has ever known, Waffles is by far the most curious. Even today, he's like a little kid trying to figure out how things work. And in case you're wondering... 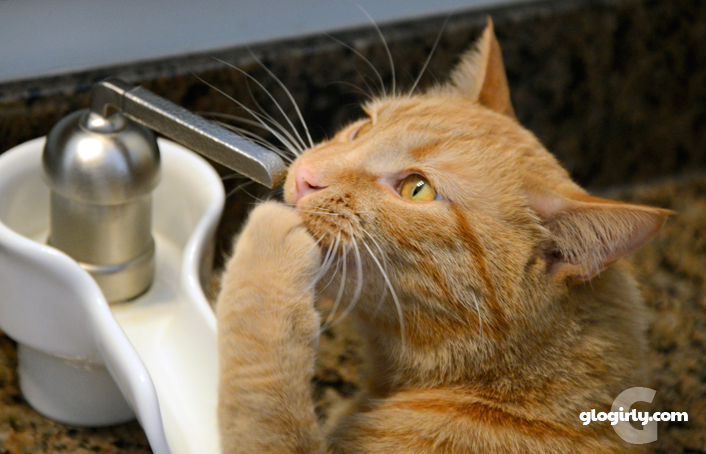 Yes, he discovered how the bathroom faucet works. Sorry, no photos of that! Waffles is just too funny. 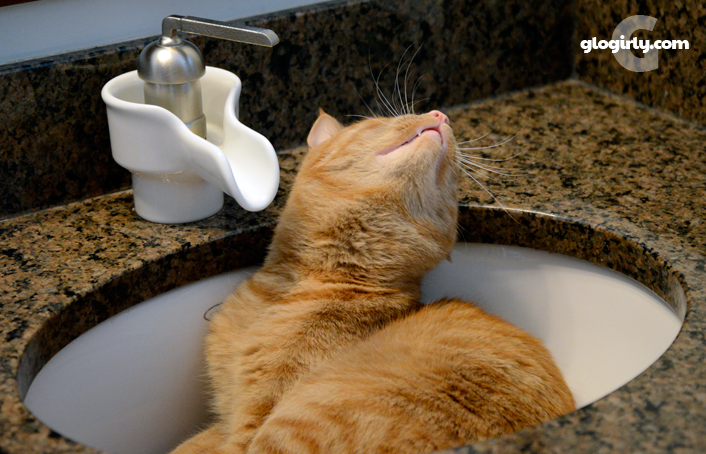 Harry the Farm cat sleep in the bathtub but he doesn't get near the faucet. Awwww he looks so sweet and inquisitive!!!! Giveaway??!!! We will be back! Well, darn! I was hoping for some how-to tips on getting the faucet to work! Ham??? Did ya say ham??? Mol! 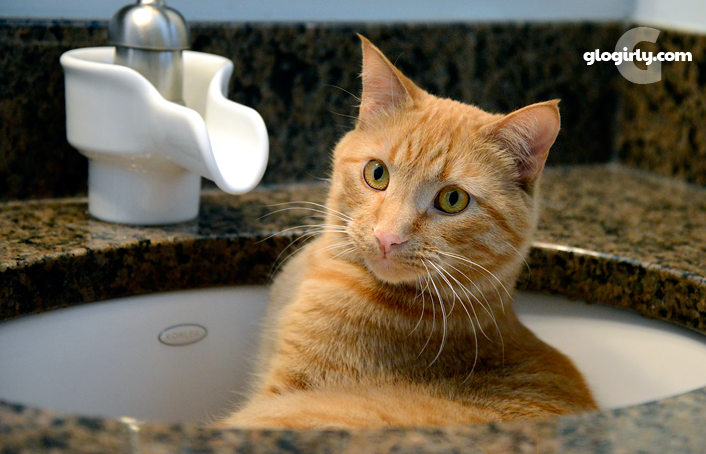 We would love to see Waffles turn on the faucet while in the sink! You can have Waffles and Ham - kinda like Waffles and Bacon. You crack me up Waffles! I like to drink from the bath tap if there is no rain water available. Mum leaves it slowly trickling for me. 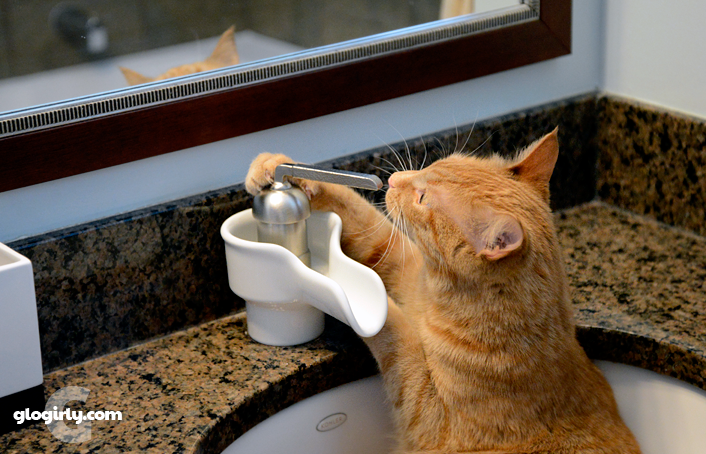 Was he in the sink when he figured out how the faucet works? Sweet boy. I wonder if that personality is an orange male cat thing... Sounds a lot like our new cat Rufus the Red. He's into everything - no cabinet or drawer left unexplored. Do you think you can get ham outta there, Waffles? Goofy Waffles! Gotta love him! Waffles, you're such a silly! Did you ever get through to the chicken or the HAM? Glogirly, thank you for sharing these pictures. It's easy to see why they're favorites. Silly, curious boy! *G* Are you sure we couldn't see, maybe, one pic of him after he figured out how the faucet worked? I'm sure the expression on his face was priceless. I love your faucet fixture, by the way. Stop singing in the mike! If ya do get ham, let us know,K? Maxwell: DOOD. Ya needed ta connect the thingamajig to the doohickey. Allie: And then PULL UP on the handle. Aaaaaaaaaw How cute. Altho' mommy sez even she's not sure she kuld figure out yous sink. Altho' it is nice. Have a pawsum day. Waffles you always make us smile :) Thanks! Waffles, did you get all wet? I like ham on my radio too, even better in my tummy. I had ham tonight! Those photos are too cute :) Waffles, you have quite the imagination.